A “Climate Talks” Update & Apply to Be a GTF! With my travel schedule as whirlwind as ever, it's been hard to find the time to update this blog! However, I have two exciting things that I just had to share with you this week. You may recall that a few months ago I was a part of an exciting documentary project called Climate Talks. This … Continue reading A “Climate Talks” Update & Apply to Be a GTF! How do polar animals survive and thrive in their harsh environments? There are two main methods that these animals use to stay warm in their icy habitats: blubber and fur (or down). Walruses, whales, and many seals have a thick layer of blubber insulation. This blubber is highly vascularized to insulate them from the intense cold … Continue reading Fat or Feathers? How Does Antarctica Measure Up? 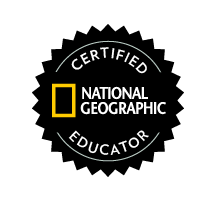 This week the National Geographic Education blog featured a post about my Antarctic measurement curriculum. You can also read a bit more about this topic in one of my previous posts. I hope you enjoy it!